Not to be confused with graham flour. Gram flour, also known as garbanzo bean flour, or besan (بيسن in Urdu), is a pulse flour made from ground chickpeas known in a number of Asian countries as gram. It is a staple ingredient in Indian, Pakistani, Nepali and Bangladeshi cuisines. Gram flour can be made from either raw or roasted gram beans. The roasted variety is more flavorful, while the raw variety has a slightly bitter taste. In the form of a paste with water or yogurt, it is also popular as a facial exfoliant in the Indian Subcontinent. When mixed with an equal proportion of water, it can be used as an egg replacement in vegan cooking. 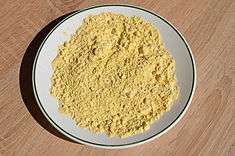 Gram flour contains a high proportion of carbohydrates, no gluten, and a higher proportion of protein than other flours. In Andhra Pradesh, it is used in a curry with gram flour cakes called Senaga Pindi Kura (Telugu: శెనగ పిండి కూర) and is eaten with Chapati or Puri, mostly during winter for breakfast. Chila (or chilla), a pancake made with gram flour batter, is a popular street food in India. Along the coast of the Ligurian Sea, chickpea flour is used to make a thin pancake that is baked in the oven. This popular street food is called farinata in Italian cuisine, fainâ in Genoa, and is known as socca or cade in French cuisine. It is used to make panelle, a fritter in Sicilian cuisine. In Spanish cuisine, gram flour is an ingredient for tortillitas de camarones. Also in Cyprus and Greece, it is used as a garnishing ingredient for the funeral ritual food Koliva, blessed and eaten during Orthodox Memorial services. In Morocco, they make a dish called karan from gram flour and eggs, which is baked in the oven. A similar famous dish is prepared in Algeria called Garantita or Karantita (believed to be originated from the Spanish term Calentica that means hot ). ↑ "What is gram flour?". Blurtit.com. Retrieved 2007-09-29. ↑ The Vegan Society. "Egg Substitutes". Vegansociety.com. Retrieved 2009-12-31. 1 2 "Chickpea flour (besan)". Nutrition Data: Nutrition Facts and Calorie Counter. Retrieved 2007-09-29. ↑ "Grains and Flours Glossary: Besan". Celiac Sprue Association. Retrieved 2007-09-29. ↑ "Senagapindi Kura (Onion curry with Besan)". Archived from the original on January 6, 2014. Retrieved January 6, 2014. ↑ "Karantita, Garantita, La Petite Panière". Retrieved July 18, 2016.